The material contained in this Website, and ‘pay to view’ Videos, is for information and training purposes only. The videos are intended for viewing by qualified manual practitioners and are for educational purposes only. They are not intended as a substitute for professional medical advice or treatment for specific medical conditions. The video contents are provided for reference only, and do not claim to be complete or exhaustive, or to be applicable to any particular individual’s medical condition. The author (Miranda Clayton) has no responsibility or liability for any errors or omissions in these videos, for the results obtained from their use, or for any damage or loss caused, or alleged to be caused, by reliance on the information contained. Your use and reliance on these videos or any other website content is at your sole risk. We try to keep the material in the website up-to-date and correct but we do not warrant or represent in any way (expressly or impliedly) that the information or any of the products or services referred to are complete, accurate, reliable, suitable or available. To the extent permissible by law, we exclude all representations, warranties and conditions relating to this website. In no circumstances will we be liable for any loss or damage including without limitation, indirect or consequential loss or damage, or any loss or damage arising from loss of data or profits, arising out of, or in connection with, the use of this website or any of the material contained in it. Nothing in these terms and conditions seeks to exclude or limit liability for death or personal injury caused by our negligence. Any and all intellectual property rights contained in this website including, but not limited to, the name www.mumandbaby-at-home.com, or in any material on the website, are owned by us subject to the license set out in clause 6 below. b) include a link or reference to this website from any other material or information (including but not limited to a website belonging to any third party) without our prior written consent. We may vary these terms and conditions from time to time by updating this page. Unauthorised use of our website may give rise to a claim for damages. This website may include links to other websites. These links are purely for your convenience and do not signify that we endorse the websites. We have no responsibility for the content of any linked website. You acknowledge and agree that www.mumandbaby-at-home.com/ Miranda Clayton is not responsible for such sites and you access those at your own risks. 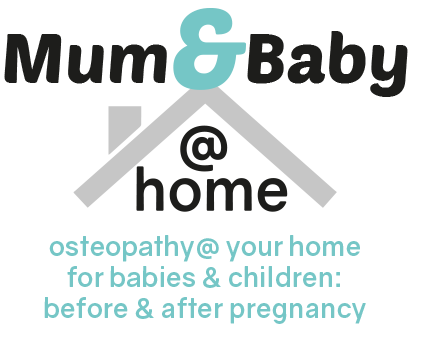 These terms and conditions constitute the entire agreement between you and www.mumandbaby-at-home.com/ Miranda Clayton and govern your use of www.mumandbaby-at-home.comsuperseding any prior agreements between you and the website. Any failure by www.mumandbaby-at-home.com to exercise or enforce any right or provision of the conditions shall not constitute a waiver of such right or provision. If any provisions of the conditions is found by a court of competent jurisdiction to be invalid, the parties nevertheless agree that the court should endeavour to give effect to the parties’ intentions as reflected in the provision and the other provisions of the conditions remain in full force and effect. These terms and conditions, and the use of our website, will be governed by and construed in accordance with English law and any disputes relating to it or the use of the information contained on it, will be subject to the exclusive jurisdiction of the courts of England and Wales. The Osteopath diagnoses and treat health conditions. Treatments are carried out in accordance with the Institute of Osteopathy’s patient charter http://www.iosteopathy.org/osteopathy/the-patient-charter/. a) For the purposes of providing treatment, Osteopaths may require detailed medical information. We will only collect what is relevant and necessary for your treatment. When you visit our practice or we visit you at home, we will make notes which may include details concerning your medication, treatment and other issues affecting your health. This data is always held securely, is not shared with anyone not involved in your treatment, although for data storage purposes it may be handled by pre-vetted staff who have all signed an integrity and confidentiality agreement. To be able to process your personal data it is a condition of any treatment that you give your explicit consent to allow Osteopaths to document and process your personal medical data. Contact details provided by you such as telephone numbers, email addresses, postal addresses may be used to remind you of future appointments and provide reports or other information concerning your treatment. Osteopaths will accept the following forms of identification (ID) when information on your personal data is requested: a copy of your driving licence, passport, birth certificate and a utility bill not older than three months. A minimum of one piece of photographic ID listed above and a supporting document is required. If Osteopaths is dissatisfied with the quality, further information may be sought before personal data can be released.All requests should be made to osteokids@aol.comor by phoning +44 (0) 7792384592 or writing to us at the address further below. We may periodically send promotional email about new products, special offers, or other information which we think you may find interesting, using the email address which you have provided. We are committed to ensuring that your information is secure. In order to prevent unauthorised access or disclosure we have put in place suitable physical, electronic and managerial procedures to safeguard the information we collect online. However, we cannot guarantee that the internet generally, or our website, is a secure medium for communication. Information you submit to us through our website, or by email, may not arrive safely or may be intercepted by third parties. With your permission, we may use your contact information to send you information about our company and products. You may always opt-out of receiving future mailings as provided below. We do not store any credit card information we may receive in regard to a specific transaction and/or billing arrangement except as necessary to complete and satisfy our rights and obligations with regard to such transaction, billing arrangement, and/or as otherwise authorized by a user. We may disclose user information in special cases when we have reason to believe that disclosing this information is necessary to identify, contact or bring legal action against someone who may be causing injury to, or interference (either intentionally or unintentionally) with, the www.mumandbaby-at-home.com site, rights or property, other users of the site, or anyone else that could be harmed by such activities.